What a blow to the chipper, laid back sunny days when we didn’t have a care in the world. Back to homework, schedules, sack lunches and most of all, back to dragging their sleepy butts out of bed at the crack of dawn and hoisting ourselves out the door to take on the hectic day. It is what it is and this banana cream pie, which we still have four slices of after our family Sunday Dinner, is awaiting the red headed one to clear away her woes. I can’t think of a better way to shake off the first day of school blahs then to put spoonful after spoonful of this creamy, luscious Banana Cream Pie into your mouth bite after dreamy bite. We ooh’d and aaah’d at dessert time last night as we shovelled the vanilla custard laced with banana slices into our mouths. If you have been craving an old fashioned Banana Cream Pie, then look no further my friends. This one is IT. The one to make and the one to eat devour. If you want to use your favorite store bought crust, I say have at it because then this will be fairly simple. OR if you want to make your own delectably crisp, flaky and just a bit tender perfect pie crust then go here and the step-by-step instructions will take you through the how-to. Just for the record, I know this wasn’t the prettiest pie you’ve ever seen, but honestly, it was the tastiest pie. If you want to see one of my picture perfect pies take a peek at my Chocolate Haupia Pie. I do have it in me to make camera worthy pies, but sometimes I am just in too darn a hurry to eat what I make to bother myself with beautiful. Oh…and my daughter had this magnificently fabulous idea of what to do with the left over couple inches of crust I had. 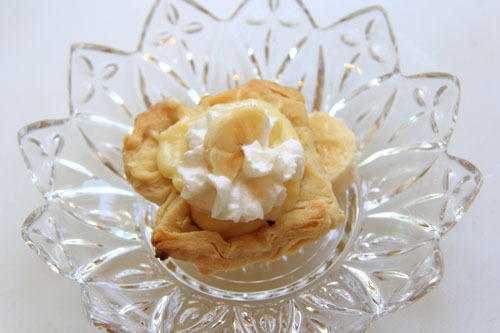 She made a gorgeous individual banana cream pie tartlet. Wouldn’t these be the most adorable little desserts for a cocktail party or wedding shower? Now SHE made hers camera worthy…wouldn’t ya say? Changed by one additonal egg from Better Homes and Gardens cookbook. 1 pint of heavy whipping cream and 4-6 T. sugar. To Make them Tartlets…see directions at the bottom of this recipe. If you are making your own crust, do that first, bake it according to directions for a pre-baked pie shell, and let it cool to almost room temperature before putting your filling in. 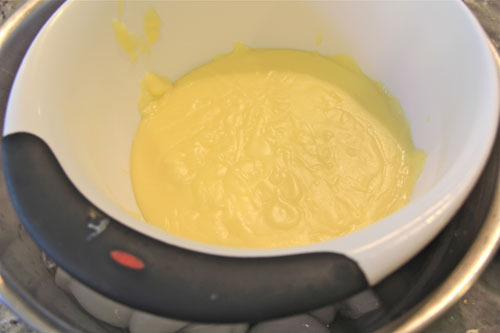 For the Vanilla Pudding Filling: In a medium saucepan combine sugar and cornstarch. Gradually, stir in milk. Whisk until smooth. Cook and stir over medium-high heat till mixture is thickened and bubbly. I stir almost constantly with a wooden spoon to scrape the bottom and sides and prevent them from burning. Reduce heat once it’s bubbly and thicker, cook and stir for two minutes more. Remove from heat. Separate egg yolks from whites. Beat egg yolks lightly with a fork. Gradually stir 1 cup of the hot filling into the yolks so as not to curdle the eggs. Return the mixture to the saucepan; bring to a very gentle boil over medium to medium high heat. Stir in butter and vanilla. Bring filling to room temperature naturally or for a quick way…put the filling in a small mixing bowl and then place ice in a larger mixing bowl. Pour some water in the large bowl (about a cup or two) so you get mostly ice with some water. Place your small bowl into your larger icy bowl and this will cool your pudding quickly. 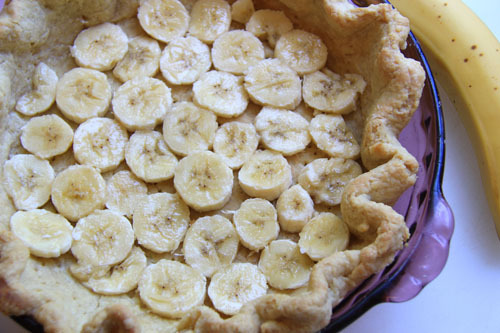 While pudding is cooling, slice two bananas on the bottom of your crust. See? Actually, I decided one row wasn’t enough and went for two rows of sliced bananas but didn’t get a snap of that. I really recommend the two layers of banana slices…it gives you a lot more banana bang for your buck…hence the two bananas in my list of ingredients. Pour your cooled filling over the bananas. Make your whipped cream by pouring the heavy whipping cream into a bowl of a stand mixer or into a mixing bowl. First beat on medium for a couple of seconds (with the balloon whisk or beaters) and then turn to high. As soft peaks form add a tablespoon of sugar at a time. I usually add 4-6. Taste it at 4 . You may like a lightly sweet whipped cream. If you like it sweeter, taste it after 5 T and add one or two more if you still want it sweeter. Top the pie with the whipped cream by either spreading it with a rubber spatula OR make it pretty and pipe it with a large piping tip such as a star tip. The largest tips work the best for whipped cream. Enjoy your creamy, dreamy Banana Cream Pie! Roll your unbaked pie dough into a rectangle and cut into 2 inch high rectangles using a pizza cutter. Then cut each into 2×2 squares. Push each square into a space of a mini muffin pan, pushing down in the middle so the sides flare a bit. Bake at 350 for about 15 minutes. 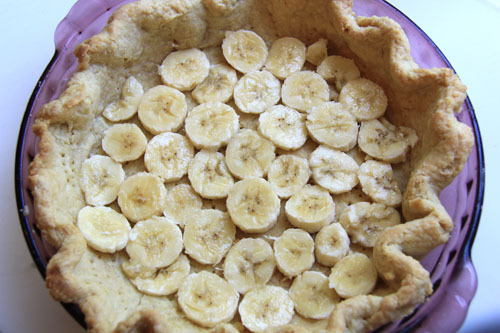 Place one slice of banana on the bottom of each tart shell and then top with a spoonful of the filling. Squirt a little bit of Redi-Whip on top and place a slice banana atop when ready to serve. I have a few photographs of my apple tartlet appetizer here if you want to take a look at the how-to for the dough. Your daughter is quite the food stylist! And this pie looks fabulous. 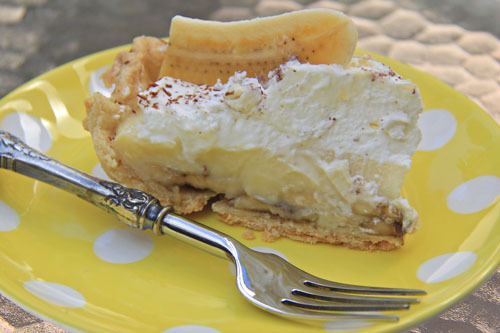 I’ve never attempted to make a banana cream pie, but this one’s going on my “to do” list! Your crust is just a marvel and the pictures are beautiful. I had to remind myself bananas aren’t my thing. Just a beautiful dessert. I love the tartlets. Looks like your daughter is well on her way to having her own blog someday too! 🙂 This looks delicious. I like the idea of having a first week of school dessert to brighten the day a bit. While there’s a part of me that looks forward to the routine that the school year brings (predictability with when I can work), I just miss sending them off again. I get so used to having them around all day. Especially this year – first year my little one goes off to pre-K. Is it too early to have empty next syndrome? LOL. I think I need a banana cream pie. Now this is comfort food! I’d like to come home to a spoonful of that! Your daughter is very talented in the kitchen, she has an eye for creativity and detail! I actually miss those back to school days, everyone was happy and sad at the same time! I’ve never been a big fan of banana cream pie, but I’m actually tempted to try yours. That looks divine. Your daughter’s creation is super cute too! The pie looks marvelous! 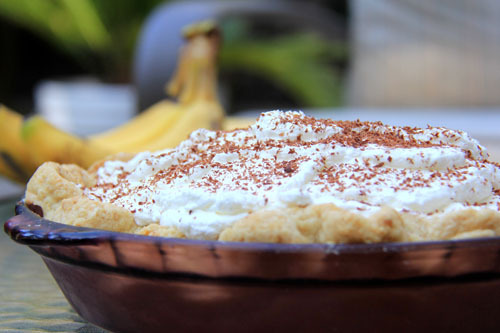 I have never baked banana cream pie before and I must add it to my to-do list! What a great way to say farewell to summer! This pie looks divine. Banana cream pie is one of my favorites. I made one with peanut brittle for Father’s Day and I couldn’t stop eating it. I love banana cream pie. This looks so delish! I love how you made tarts too. Awww, you’re a good mum to make this when they’re feeling down! I bet it works too. This looks delicious. Your daughter is quite the genius! That tart looks amazing! Now that pie looks great! and your daughter did a fantastic job on the tart-lets…great idea. I can only hope that Spring starts soon! I haven’t had banana cream pie since I ate my grandmother’s when I was little. What a great dessert! LOVE the tartlet, congrats to your daughter!! School’s started here as well. I have more time for baking, but don’t like that we now have schedules. Yum, yum, yummy! We usually save banana cream pie for Thanksgiving – I have no idea why?? – but it definitely needs some summer love, I think. 🙂 And your daughter, amazing- I think she takes after her mom. 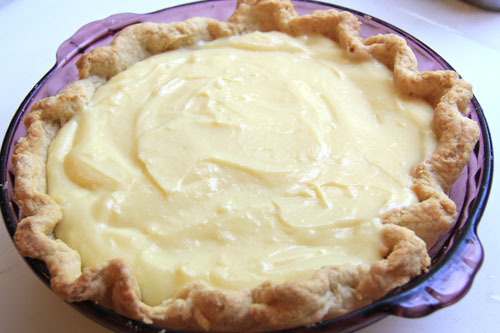 Ooh, I’ve been craving banana pudding, but this pie looks even better! I think this pie could beat away any blues ;-). Hopefully spring is just around the corner here for us – this winter weather is not fun. I LOVE bananas..you really had me by the title..
Well, since summer never really started around here, the fact that its almost over feels irrelevant. I don’t know if that’s a good thing or a bad thing. This pie sounds amazing though. I think I’ve had banana cream pie twice in my entire life and that’s it. That’s a good enough reason to make an entire pie for myself right? Absolutely! I always believe in making or baking for yourself. My favorite pie ever, thanks for sharing! So lovely..I love bananas..this is like the easiest pie ever if I m able to pull out the crust 🙂 You girl had a fantastic idea on the left over crust..I could eat so many of those! What a scrumptious looking pie! This is such a perfect way to used up ripe bananas! Thanks for sharing. I adore your recipe for Banana cream pie. And your daughter will definitely have her a new blog in no time .. I agree with Kristy. Amazing. I actually keep encouraging he to have a page on my blog…but to no avail…yet! I love your daughter’s suggestion! My girls have until Labor Day before they start school, so I feel like we have another two weeks of summer. 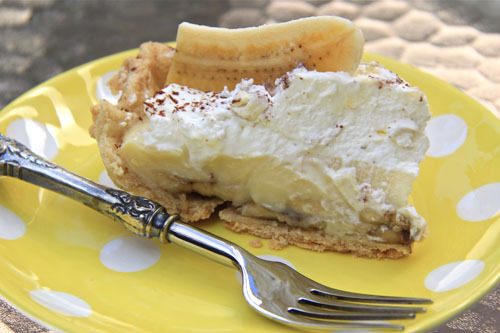 I love banana and this Banana cream pie looks delicious. My daughter goes back to school this Thursday and I can’t believe summer break is coming to an end. Your daughter is brilliant with the individual pie! She could pack it in her lunch for dessert! We have banana’s that I need to use or freeze, I’m thinking my boys would love this pie right about now, well they are sleeping but for dessert tonight! Banana Cream pie is the Best! Hands down!